NASA is in celebratory mode as its spacecraft Juno, on 5 July, successfully entered the Jupiter's orbit for a mission to study the planet. "Success! Engine burn complete. 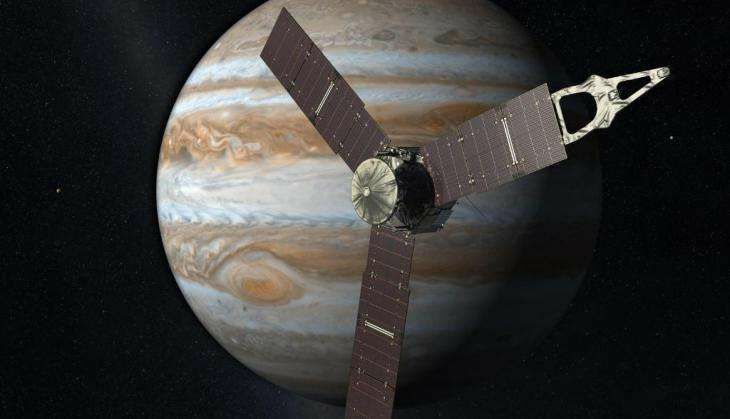 #Juno is now orbiting #Jupiter, poised to unlock the planet's secrets," NASA tweeted. As per recent updates posted by the National Aeronautics and Space Administration, Juno's main engine has been switched off and the spacecraft is in the planned orbit. Juno has completed one of the riskiest and most important parts of its mission and now the spacecraft will re-orient itself to face the sun and recharge its batteries. "It's not over yet. We're still awaiting word in a few minutes that the solar-powered #Juno is facing the sun," tweeted the US space centre. After that, it will switch on its main antenna and start communicating with Earth, though the procedure may take some time, reports the Guardian. "Welcome to jupiter," a voice said over the radio at NASA's Jet Propulsion Laboratory control room, with scientists cheering, clapping and hugging each other. "You're the best team ever! We just did the hardest thing NASA has ever done," said principle investigator of the Juno mission, Scott Bolton. The spacecraft reached the orbit after a five-year long voyage of 1.8 billion miles. On Tuesday, Juno turned away from the sun and fired its main engine. A 35-minute burn slowed the spacecraft to 130,000 mph and allowed it to be captured by the planet's immense gravitational field. Juno will deeply study Jupiter's clouds to learn how the planet formed; what drives its brilliant aurorae; and how its complex weather systems produce the giant red spot and the swirling, enigmatic stripes that decorate its outer layers.